I feel like I’m really moving on with this challenge. I already have three color schemes in mind. Everytime I think, 27 yes, BUT that means 73 to go, I have some moments of anxiety to finish, but, honestly, it is getting even more fun choosing colors and just going at it. For newbies to this site, I would like to explain that my goal for this blog was to just jump into new methods and new materials and have fun. If something that day didn’t come out as I expected, I posted anyway (and looking back at some of the posts, I can only shrug my shoulders and go on to the next painting. ) BUT, for this challenge, the 100 pieces were to be done in pastel, a chosen size (5 X 7) , completed in 30 minutes ….. or just stopping at 30, no matter what still needed to be done!….and each one different. AND, if you feel like being a part of it, I would truely appreciate you looking back at all 27 and tell me what you like best about them. Or if you don’t like them, that’s ok, I can take it……..I think! I’m working on a way that I can post them on the same page. I can tell you the impact is amazing, if I do say so myself. 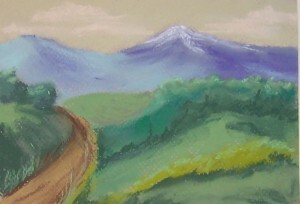 This entry was posted on Tuesday, February 22nd, 2011 at 8:58 pm	and is filed under 100 Pastel Challenge, Color, Landscapes, Paintings, Pastels. You can follow any responses to this entry through the RSS 2.0 feed. You can leave a response, or trackback from your own site. The thing that amazes me and makes me appreciate you even more as an artist is that each piece is different enough to seem like it’s another project! Marvelous. Thank you very much, Leila………………….but I sometimes wonder what I’m going to do when I get around #75!!! Oh, I meant the 75th painting, not the age……………….or maybe both, who knows? I’m working on number 28 (I think) tonight.